the same high quality that they are known for. You will look and feel marvelous knowing you are wearing something special from Eileen Fisher. There is a reason that Shelly Komarov has won so many awards. Her beautiful dresses begin with a piece of flat white fabric which is then cut, sewn, crinkled, and printed with original designs. Gorgeous but not fussy, they are washable, packable and extremely comfortable. Fun day out or special occasion (think wedding) and they fit everyone. Trust us on this! Do you love interesting styles and fabrics, washable and packable, made in USA and extremely wearable for so many of your wardrobe’s daily requirements? 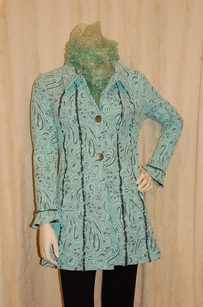 Then this designer is for you, with fabrics sourced out of Europe and looks that say today! The name almost says it all. Add in stylish, easy to wear, and very affordable and you will get the full picture. And it’s made in the USA – what’s not to like! This line nearly has a cult following. Ayse is an amazing designer who never seems to run out of creativity and always manages to make you look terrific. High quality, made in USA, and never ordinary. Women covet this designer and for good reason. Superior fabrics, precision styling, remarkable fit – well you get the idea. As their motto says, “Nobody knows me like Joseph Ribkoff!” Come see what the fuss is all about. In a word – quality! Best t-shirt ever, and tops, skirts, and pants too. They do everything right, from the fit to the dyes to the stitching. Made in USA perfection that will be in your closet looking great for years to come. If you are a sweater lover like us, then you will be happily amazed at our unique and hard to find selection. We’ve got Curio (NY), Aldo Martins (Spain), M&Kyoko (Japan), Margaret O’Leary (SF), Beyond Threads (Peru), Diktons (Barcelona), Krimson Klover, Caamano, Pure and the list goes on! We think we’ve got you covered like no one else. We all need them. What we don't need is the hassle of getting them to fit. No worries here. With our diverse selection and expertise you'll be looking great from every angle.